I quit WoW in 2011, but watching Sword Art Online (an anime series about players trapped inside a VR MMO) made me nostalgic for it. 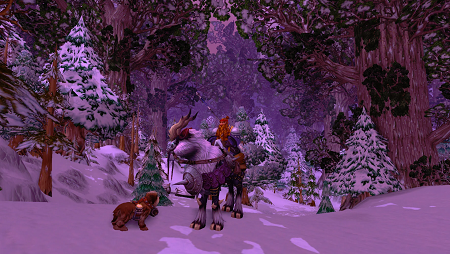 One of many things I’d forgotten how much I enjoyed about WoW was how pretty it can be; this screenshot is from Winterspring, one of my favorite zones in terms of visuals. The game is leagues more casual-friendly than it was five years ago, too. I tend to play MMOs as solo games, which sounds weird but works for me. I like seeing other people, and I enjoy the randomness that injects into the game world, but I mostly do stuff by myself. But dungeons? Dungeons are awesome now! Teleport in from anywhere, group with random folks across multiple servers (so, thanks to time zones, there’s almost always a group ready), teleport back out when you’re done. And the XP and loot is excellent. So instead of ugh I remember how much of a pain this zone was I can just run dungeons for five levels until I’m ready for a more fun zone. Rock and roll. Also, I can play a drunken dwarven monk whose dog carries his beer for him. Yes.